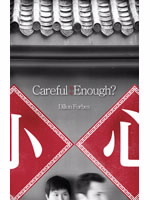 Today we are interviewing Dillon Forbes, author of Careful Enough?, a fiction book for teens. In the book, Daniel has the opportunity to move to China during his senior year of high school to work with a Christian ministry. In China, Daniel finds many restrictions on expressing his faith. He can only say words like “Christian” to trusted friends. But he soon discovers that there is a fine line between being cautious and being afraid of his faith. Q: Dillon, what made you want to write a fictional book for teens about Christian work in China? A: That’s a great question, and thanks for asking me to share about the book. The book came out in 2008 when the Olympics came to Beijing. That was a moment for the world to be fascinated by China, and an opportunity to build bridges between China and the rest of the world. At the same time, Christian ministry was already taking place all over China in some exciting ways and places. I felt that many Christians outside of China might not be aware of what was taking place in China, in terms of local, meaningful ministry going on there. I also had a burden to help readers imagine what it could be like to do ministry in a non-traditional missionary field, like China. Q: This book is written for teens. Do you feel adults could enjoy the story as well? A: I aimed at an upper teen age level as I wrote the book. Teens can identify with leaving a high school life in America for a very different one in China. At the same time, this book clearly and accurately depicts the life of a foreigner doing ministry in China. I believe anyone who is interested in learning more about ministry in China could enjoy the book and profit from it. Q: As an author, I know it’s important to share with my readers on the internet as well as in books. Why can’t we find more information about you and your ministry on the internet? A: Right. I decided to use the name Dillon Forbes to publish this book, but that’s actually a pen name for me and some others who helped me in writing the book. Each of those who contributed to the book has personal experience working with Chinese people. We decided to use a pen name, because we felt that using actual names might put some existing ministries in China at risk. We wanted to avoid that. Things seem to be fairly stable for Christians who work in China now. So if we had to write the book again today, maybe we would do something different. But we decided to use a pen name. Q: What are the challenges of using a pen name for a book as opposed using your real names? A: I have to say that promoting the book becomes very difficult and is the number one problem. Normally people expect an author to have a website, Facebook, and other forms of social media. But when we decided not to share specific information about the author and situations behind the book, that made traditional kinds of promotion almost impossible. Q: Of course, your book is written as fiction, but is Careful Enough? really true to life? A: Yes, I would say that Careful Enough? gives an accurate picture of one kind of ministry that is being done in China today. It is true to life for the hundreds, possibly thousands of Christians who are doing that kind of ministry in China today. What Daniel is able to see and do in China is reflective of what dozens of young people I know have been able to see and do in China in recent years. Now, there are many different kinds of ministry taking place in China, some by Chinese believers and some by foreigners coming in. The more I experience China ministry, the more surprised I am about seemingly endless opportunities to serve, teach, witness, and help people in China. Q: Can you expand on that? What kind of ministry is possible in China today? A: Some people over there do evangelism, which is something foreigners can often do in conjunction with teaching at a Chinese school or university. Some do various forms of Christian teaching and discipleship among Chinese believers. Some help with church planting and translation work. Leadership training has grown a lot over the years as well. And I’ve heard of people doing music ministry, movie making, book writing, creative craft manufacturing for Christians –like making flannel graph boards and things like that. So you are really just limited by your imagination and God’s working in your life as to what you might be able to do in China today. I might add as personal advice that just because something can be done in China doesn’t mean that it’s the best thing to do there. I mean, I’ve heard of people dropping thousands of printed tracts out of planes over Chinese villages, and usually that kind of behaviour is not only going to get you into trouble really fast, it can also produce a kind of resentment against Christians for making such a big mess to clean up. So, like everything we do for the Lord, you need to do ministry in ways that are responsible and show good use of wisdom. Q: In the book you mention the role of humor in Chinese ministry. Can you explain that? A: Sure. Doing ministry in any of the “creative access” nations in the world can be stressful. You can’t just say whatever you want. You need to be careful to do ministry in a way that doesn’t force the government to take action against you. So there is a constant carefulness about your life that can cause tension to build up. We have found that looking for points of humor in our life and ministry can help to reduce that tension. Q: Dillon, what positive differences have you experienced in Chinese culture as opposed to Western culture? A: Well that’s an interesting question, since different cultures have things that we as Christ followers and people in general would identify as “positive” aspects. But, to focus on positive aspects of Chinese culture in contrast with life in the West, I would say that relationships are much more valued in China than they sometimes are in the West. In the West, time is all important. We want to get our list of jobs done each day. We have fancy apps and devices to help us save time and get everything done. Now, I’m not saying they don’t have the same smartphones or devices in China, but they use them in different ways. Making time for people and relationships is still very much a part of daily life in China, which is something that most Westerners would agree is often lacking in our societies. It’s not all that uncommon for foreigners to be befriended by Chinese contacts in China and enter into all kinds of interesting relationships with people there, even from very early in their stay there, which is something Daniel also experiences in the book. Q: Dillon, what resources can you recommend for people who are interested in learning more about ministry in China? A: Sure, I know there is a nice DVD presentation about China ministry called: No Regrets, No Retreat put out in a series called, “Dispatches from the Front.” That DVD gives people a basic introduction to ministry in China just over an hour. They have a free trailer online, which you might link your readers to see. Trailer for “Dispatches from the Front” (DVD series). I would also highly recommend something called ZGBriefs, which sends out a weekly email citing a ton of helpful online articles about China. Their topics include everything from politics and religion, to daily life and language learning. The people who send the emails have a lot of experience working in China. Thanks, Dillon Forbes, for allowing us to share this exclusive interview. Read the first chapter and find discussion questions here. Next week we’ll look at Chinese ministry in Taiwan. Your statement, “You need to be careful to do ministry in a way that doesn’t force the government to take action against you,” was interesting. Especially since in America we’ve been so used to religious and speech freedoms, but are now finding our freedoms threatened and legal actions against people standing up for their convictions. I’m interested in your thoughts about our call as Christians today: do we boldly speak out against the government? Or do we follow the laws and work quietly as Christians even when we disagree? I look forward to reading CAREFUL ENOUGH? to learn more about how you deal with these matters in a closed country. You ask an interesting question. The Apostle Paul spoke boldly for Christ in spite of persecution and imprisonment. Yet in Romans 13 he still encourages Christians to submit to government. He obeyed laws and government except when those laws required him to disobey God. He spoke to government officials with respect. As Christians we need to speak out on certain issues, but, personally, I’m concerned about the blatant disrespect that many Christians use in talking about government officials. We can state our views clearly, with our reasons for them, and still do so in a respectful way. Careful Enough? does deal with this issue as it is a major issue for people who minister in China.